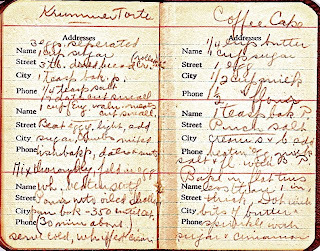 My aunt wrote asking if I had my great-aunt's journal that contained a recipe for Krummer Torte. I did, but could not read it well so got the idea to photograph it. Then Aunt could enlarge it and read the exact ingredients and amount. She is planning to make it soon. Obviously she has some sweet (no pun intended) memories of eating this when she was a little girl. Or maybe it was something served throughout the family history. Now I'm thinking maybe I should make it myself sometime.